Still a nice selection of them. Same story with fluorescent. They sell T12 HO and slimline etc. Nice, they're almost impossible to find over here now, except for specialised lamps such as fridge and oven bulbs. Same story with these federally exempted incandescent light bulbs here. The last time I was at Menards they had one end cap stacked up with GE 60W soft white from Mexico, as well as some 40W reveals and other NOS pre-ban bulbs in the aisle. Cool! Those GE 3-ways in the yellow packaging and the older style Reveal packaging look like NOS. They're probably trying to clear out the unsold stuff from the stock room to make room for the new LED's. My basement is still full of pre-ban light bulbs. I went crazy before the ban, and I guess now I am glad I did! I collect exit signs, preferably vintage ones. I also have a little bit of a thing for light bulbs, too. Of course, hoarding them due to the incandescent bulb ban. Looks like a lot of NOS incandescent and halogen lamps. 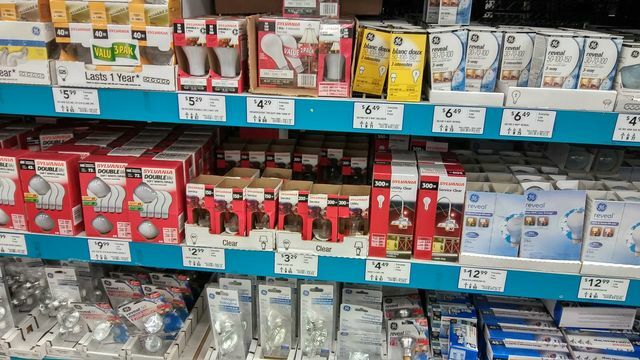 There might be a few French-made Sylvania halogens mixed in with the USA-made ones on the shelf. The GE 3-ways with the previous generation packaging are either made in the USA or Mexico in factories that are no longer in business. I'd go on a shopping spree here! Feb 11, 2019 at 09:57 PM Author: Cole D.
I got one of those 300W Sylvania Service bulbs for 94 cents when they were on clearance in the summer. It's for my collection. I also got some Sylvania MV on clearance, the rest of them ended up at Habitat somehow.